This photo for representation only. Click on the larger image below to open a printable PDF at the proper size with measurements and George in multiple scales. Meet George! He’s a porcelain gardener doll in 1:12 scale created by Little Women of the UK. 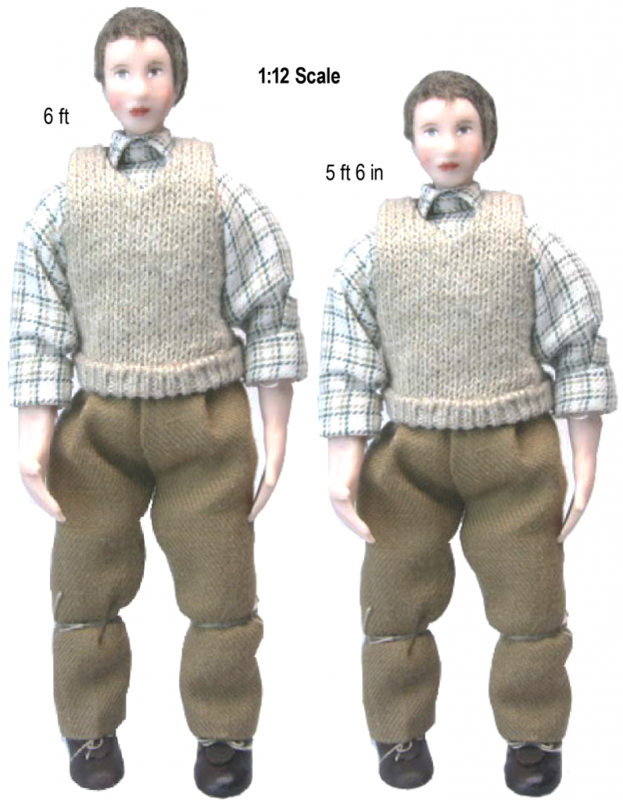 George represents an average male at six foot tall, while his clone to the right represents an average female at five foot six inches tall. In the printable image below, they are shown in multiple scales common to dollhouses, miniatures, and trains. These photo pairs can be used as a scale check—they’re lightweight, don’t take up much room in your bag, and are easy to relate to. Looking for chairs in particular scales? They should have a seat that falls just below the knee. How big would that tree be in your scene? Guesstimate how many man-heights it would be. May we suggest that you cut out and glue photos of George in the scale you need to a piece of cardstock. Spray the paper with fixative or laminate it to last longer. Then carry George with you when shopping for other items in a similar scale. He may be the silent type, but he’s glad to get out and about! • Four main dollhouse scales—1:12, 1:24, 1:48, & 1:144. • Four railroad scales—1:24 or 1:25 (G scale), 1:64 (S Scale), 1:87 (HO scale), and 1:160 (N scale*). • Common metal soldiers, Britain’s collectible figures, as well as many collectible village figures—1:32 scale. • A basic size for gaming miniatures, typically between 25 and 28mm—the tallest figure in 1:72 scale is 25mm. * Note: N scales can vary greatly. 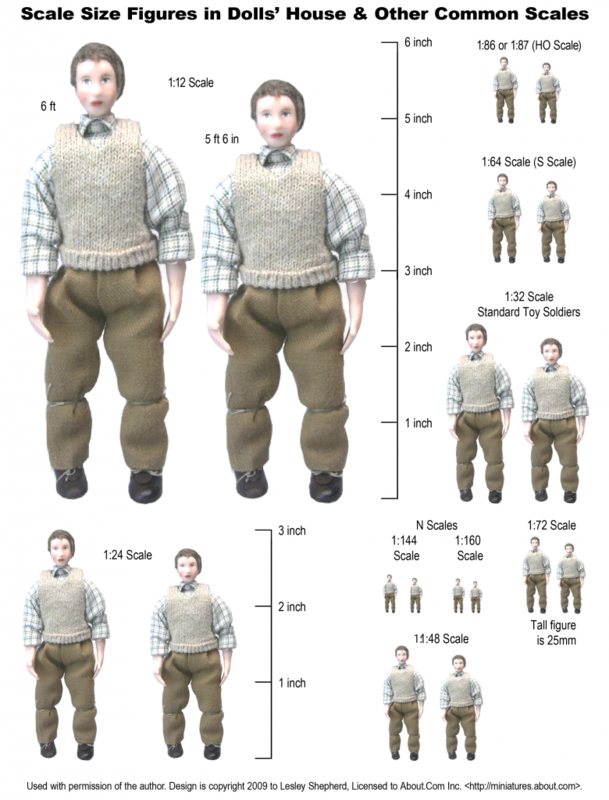 The figures given in N scale are 1:144, which is used for a doll’s dollhouse inside a 1:12 scale dollhouse, but which is very close to the 1:148 scale used as N scale in the UK. N scale in the United States is usually 1:160, the other figure size shown for N. Some N scale railway pieces will not work with each other due to these differences. Check the location of the manufacturer to help determine which ratio the N scale piece you are interested in is set to. ~ by Lesley Shepherd, About.com Guide. Used with permission and adapted from the former page <http://miniatures.about.com/od/scaleminiatures/ss/scalecheck_2.htm>. Click on the image above to open a PDF at the proper size for printing.